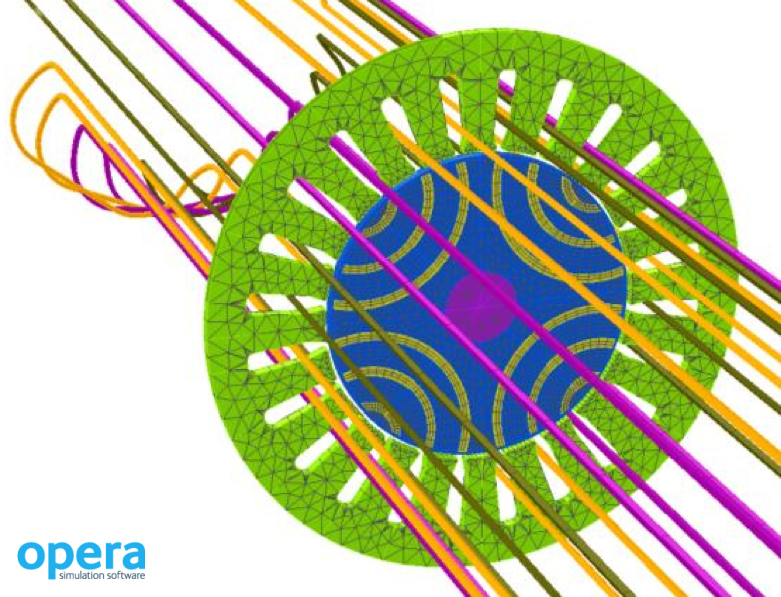 Aurora, IL, July 27, 2015 — A powerful new version of the Cobham Opera electromagnetic and multiphysics design software has been launched. The new version 18 release of this renowned finite element analysis and simulation software incorporates numerous enhancements to boost functionality, speed and accuracy, while further improving ease of use. Key new features in Opera v18 include a powerful analytic tool to help users quickly assess different winding configurations in rotating electrical machines. A new graphical analysis setup tool brings drag-and-drop editing simplicity to complex evaluation sequences involving multiphysics simulation. The modeling of materials with very small skin depths is also made much simpler by a new surface impedance boundary condition for transient electromagnetic analysis; the code for this software is also specifically structured to allow parallel processing to accelerate analysis. The new tool for electrical machine design can shorten development times significantly, by allowing highly detailed investigation of possible winding options prior to finite element analysis and simulation of the most promising designs. Called the Winding Tool, it enables designers to assess the feasibility and efficiency of different coil winding configurations – and their impact on machine performance – very easily and quickly. The software includes a winding wizard which creates a report of all feasible windings for a user-specified range of slots and poles, backed by detailed winding characteristics for each slot-pole combination. It is available for both the two-dimensional and three-dimensional Opera design software packages. The Opera-3d Modeler now has a graphical tool to simplify the preparation of data for analysis. It provides users with a very convenient means of controlling the sequence of analyses, using drag-and-drop editing to add or remove specific analysis stages to a list. Context sensitivity allows the tool to give instant visual feedback on the validity of requested changes, while the properties and parameters of analysis stages can be adjusted within the tool’s environment. Individual analysis stages can be saved out and used in other sequences to further speed the design process. The new Analysis Setup tool simplifies advanced multiphysics simulation significantly, including transient analyses. Users can now set up a complete chain of electromagnetic, thermal and stress analysis simulations for example, with no limit on complexity or sequence. Loops are allowed and the results from one simulation are passed automatically to the next. Shape deformation caused by forces acting on a model can be employed across different types of simulation; the deformed mesh from stress analysis can be nominated for use in subsequent electromagnetic or thermal analyses. In the case of coils, the software automatically accommodates any changes in current density values due to shape deformation, facilitating very accurate electromagnetic field analysis. 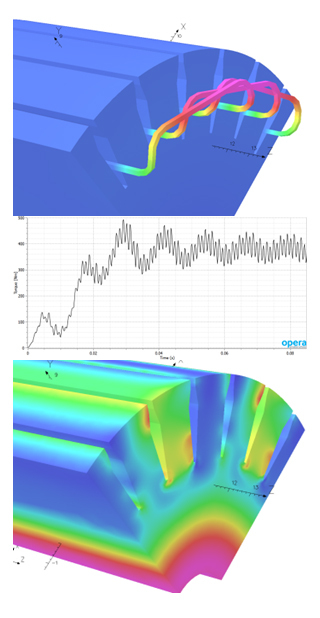 Another major feature in the latest release of Opera-3d is that the scope of the surface impedance boundary condition (SIBC) has been widened and is now available for use in transient electromagnetic analysis – including Demagnetization and Motional Analysis. This simplifies the modeling of materials with a very thin skin depth (compared to the size of the model) by replacing the volume elements in a conducting region with surface elements. The variation of fields and currents below the material’s surface is represented by a decaying waveform which models the skin depth. Version 18 of Opera also consolidates or extends a number of features that were introduced in the previous version of this software. These include the ‘solve as 2d slice’ feature, which is now standard in the Opera-3d Machines Environment. It enables users to evaluate machine performance using a one element thick slice obtained from the full 3d model, with the appropriate boundary conditions applied automatically. Depending on model complexity this can dramatically reduce the number of elements that need to be solved – often by several orders of magnitude – resulting in much faster solution times. There is almost perfect correlation between results obtained from the 2d slice and the full 3d model, and the 2d slice can be converted to 3d to analyze end-effects. The graphical user interfaces of Opera-2d and Opera-3d continue to make increasing use of tabbed menus to simplify operation and many are now backed by keyboard shortcuts. Enhanced context sensitivity means that drop-down menus are much shorter and mainly replaced by menu bar icons, allowing fast, single-click navigation and control. All high-level user interface functions can be displayed in English, French, Chinese and Japanese. Cobham has also taken the opportunity to further extend Opera’s interoperability. Version 18 extends the optional links previously available to a wider variety of third-party computer-aided design packages. These now provide the ability to work with CATIA, NX, Pro-Engineer Creo and SolidWorks files. IGES, Parasolid, SAT and STEP files offer CAD-neutral geometry access. Opera is one of the leading multiphysics design automation tools, used by industrial and scientific organizations worldwide. The software is available in many variants, with generic 2D and 3D finite element solvers and application-specific solvers for static and time-varying low-frequency and high-frequency electromagnetic, electrostatic, magnetostatic, structural, thermal and space charge design problems. Typical applications include the design, analysis and performance optimization of electric motors, generators and electrical transformers, permanent, normal conducting and superconducting magnets, and charged particle devices such as magnetron sputterers, electron microscopes, X-ray machines and CT scanners. 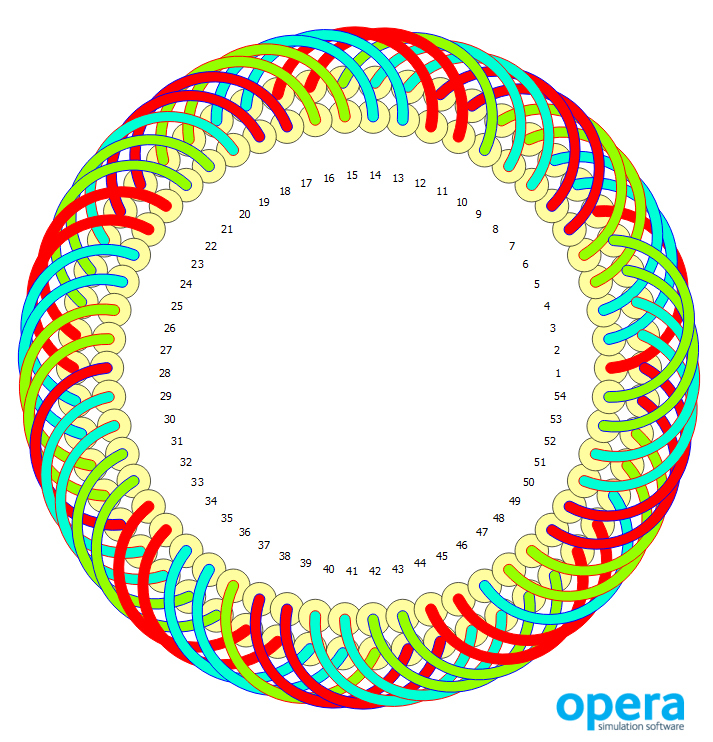 Opera v18 features a new Winding Tool that enables users to quickly assess different winding configurations in rotating electrical machines. 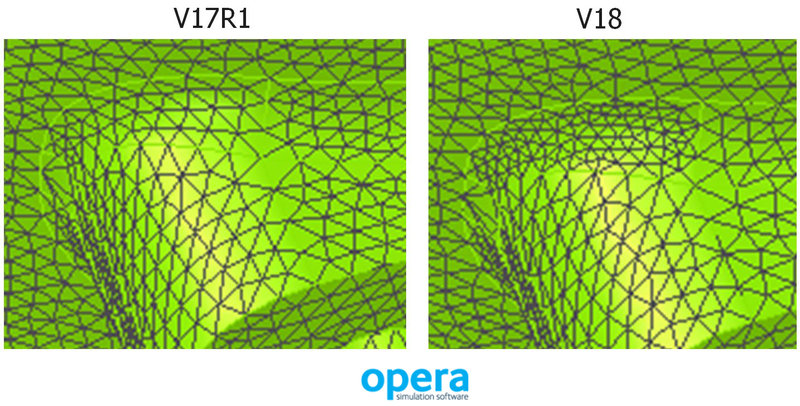 The ‘Solve as 2D slice’ feature of the 3D Machines Environment in Opera v18 speeds solution time by significantly reducing the number of elements that need to be solved. The mesh generator of Opera v18 has been enhanced to provide more uniform distribution of element sizes on spline surfaces. The new Analysis Setup tool in Opera v18 enables users to set up a complete chain of electromagnetic, thermal and stress analysis simulation, with no limit on complexity or sequence.